"A hard working crew of two did a great job washing our vinyl sided house and barn, including the asphalt roofs. They were professional and worked for four hours straight without a break. They were careful not to impact our landscaping and nearby pond. Some streaking occurred in the days following the wash. Chris said it would wash off with the rain and it did completely. Chris was very responsive to questions and discussions prior to and after the work. High quality service at a resonable price - what a concept! Highly recommended! " "Pressure King worked on our condos and they did a great job. They did a very thorough job. A company we used last year did not do that, they left all the spider webs and buildups and only cleaned the obvious. But Pressure King didn't they actually took the time and sprayed everything you can think of! I totally recommend Pressure King. Thanks guys!!" 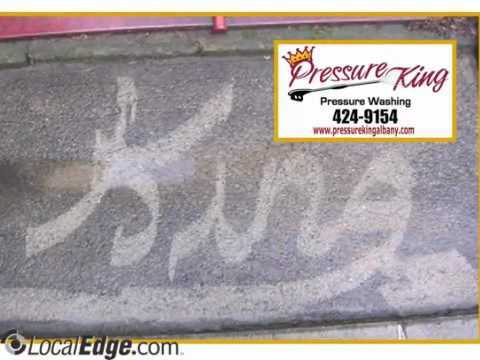 "Today the Pressure King Power Wash Team arrived and spent most of the day power washing the entire exterior of our large home and extensive patios and walkways. The crew arrived on time and did a terrific job throughout the day. The entire property looks better than it has in many years. The crew worked quickly, efficiently, and arrived with superior equipment. The house is three stories high in the back, with vinyl siding - the northern exposure had a good deal of algae. Now - it looks like the day it was installed. The crew was courteous, careful, and left the entire work site tidy and clean. Thank you!" If you are the owner of Pressure King and would like to make changes to your business listing information, click here.